As a beginner, this is one of the stages of learning and possibly, a period that you, as an adult beginner will struggle with. There are so many things to learn, new moves, ballet terms, controlling your body, pointing your feet etc. Most teachers understand when we struggle with remembering the steps! Ballet teachers don’t like it of course…hahaha. First of all, realize that you have to be patient with yourself. Meanwhile, here are some tips that you may try to cope with this stage of learning ballet. Learn your ballet terms quickly. Learn what each move is called. Make sure you stand behind someone who is dependable on remembering the steps for now. Don’t look in the mirror! Looking in the mirror at yourself slows down the learning process. Look at it sometimes, but try to see your movements in your mind. going down to a slower class. It is not wasted, you will learn better once you establish solid technique instead of using all energies to memorize the combinations. Instead of memorizing, “3 tendus front, one plie”, try remembering them in sets of 4, or sets of 8. Notice what’s the slight pattern change in each set. If you’re good at looking at patterns, try figuring out the patterns. Soon, they’ll be so familiar with you. When the teacher is demonstrating the steps, don’t stand and try to memorize it using your eyes. Mark the steps along with the teacher. If your left side is weaker, use your left side. Unless you still have a problem mirroring accurately then mark alongside with your teacher. When you’re confident enough, try one day to stand at the end of the barre. The reality of not having anyone to follow will force your mind to really focus on learning the ballet combinations. Usually as a adult beginner, you’re not too familiar with ballet terms, and that makes it a lot harder. When the teacher demonstrates a combination, he or she usually names the string of steps. However, only one part of your brain is engaged – visually – because your brain does not bring up images of what she’s speaking, but rather processing her movements. requiring less effort to remember the steps. If you learn them quickly, your brain becomes familiar with them and hence you will find it easier to memorize steps. That is because you’re memorizing in subsets, and soon you will start to learn a combination in a way as you would when you use mind-mapping skills. How to learn ballet terms? Remember the terms your teacher uses. Repeat them under your breath. The more you say and mark with your body, the quicker both mind and body registers the step. If you’re in a slower class, and if your teacher is open to asking questions, go ahead and ask in detail how the step is to be perfectly executed. Of course, attend more ballet classes! The attention you give to a ballet term, the quicker you remember. Similarly to learning ballet terms, your body will take a while to register the movements and get used to performing it in one way. Think your body movements like a car travelling on a long road full of twists and bends. and not move ‘to where it is grass’. Know what I mean? I hope you understand this analogy. you may also visualize by watching professional dancers execute steps. Why Do Children/Youths have an easier time with Learning Combinations? No, it is not because they are younger and have a better brain than you. In fact, many ballet teachers tell me they enjoy teaching adults because their minds are so quick to understand. Much, much faster than their young students! If that adult beginner is also very body-aware, they can learn very quickly and can catch up with ballet students half their age! The problem most adult ballet dancers have is that their body is slower to do what their minds tell them to do. It is not because your learning ability is reduced but rather, we’re more used to typing at the computer, loading the washing machine, driving, cooking and all these motion pathways have been established for much longer. Learning to dance ballet is to learn new motions, making new pathways for your body to move. We’ve also lost quite a bit of body awareness due to being less active physically (well, most of us anyway). We don’t play as much sport, or run around, or walk even. But you know what? Children these days suffer the same problems too. David Howard, a master ballet teacher, teacher to the ballet stars say that children these days take a longer time to develop coordination in dancing ballet. That is because they spend more time in cars, rather than walking, running or riding a bicycle! At this point, you’re learning many new things, ballet terms, combinations, and probably a little technique. While, you’re probably only absorbing very little technique, this is the process that we adults learn ballet, due to how adult ballet is taught. before a new move is introduced. For instance, what we learn in an adult beginner open class like an assemblé takes typically 6 months to 2 years in full time ballet school. performing cleaner, more precise movements as their learning years roll along. As adults, we’re often thrown together in about 3 levels, beginners, intermediate and advanced, though it is common to see people with different abilities jump all over. Adult classes are not as numerous as children’s classes (unless you live in New York City), and people of different levels turn up according to their schedule, determined to work their body. However, some ballet studios realize the difficulties adult ballet beginners have with learning ballet, so now they offer what is called a ‘basic ballet class’ or ‘an introduction to ballet’ class or a ‘foundation class’. They will start from the very beginning and teach you the positions of the hands and feet. 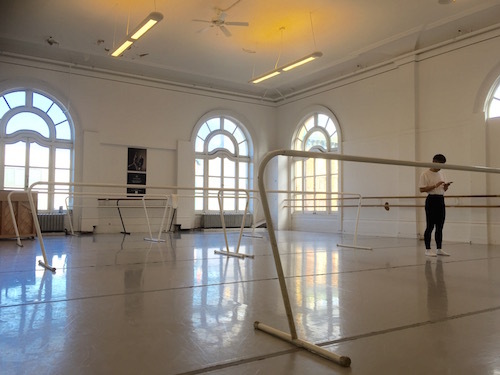 Read more about the difference between a ballet beginners class and a foundation class. Thus, don’t be too hard on yourself. Be patient, but don’t rely on the person in front of you forever! As for me, I have no trouble memorizing combinations in beginner classes, and sometimes get them wrong in intermediate class, but in advanced class – I’m still struggling!